Terrell Owens didn't have to wait until his third year of eligibility to be selected to his latest hall of fame. 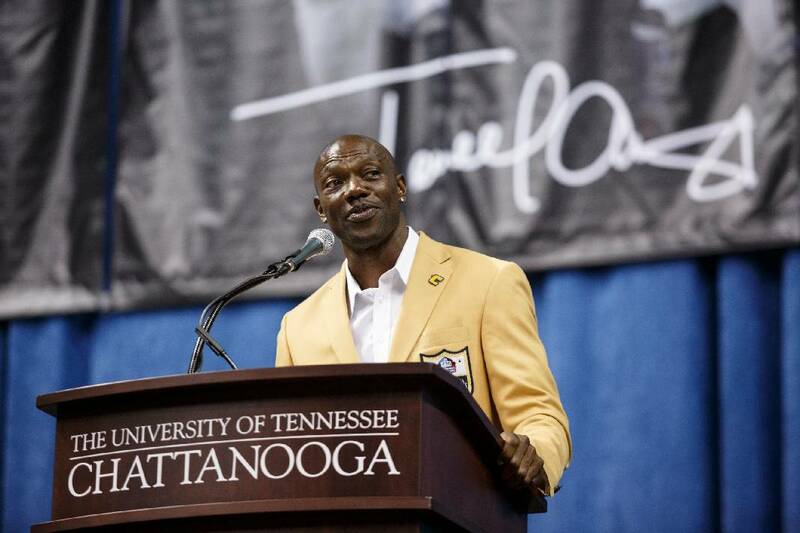 The former University of Tennessee at Chattanooga and National Football League star wide receiver turned 45 on Dec. 7 and will be inducted into the Greater Chattanooga Sports Hall of Fame on March 4. That is the minimum age for membership. Owens, of course, made history last summer by accepting his induction into the Pro Football Hall of Fame in a ceremony at UTC instead of Canton, Ohio, with the rest of the 2018 class. He was miffed because he wasn't selected when first eligible two years earlier. He'll be one of 20 inductees in the 6 p.m. banquet ceremony at the Chattanooga Convention Center the first Monday in March. There also will be seven special award winners, to be announced later. Tickets cost $40 — $320 for tables of eight — and can be bought through hall president Catherine Neely at 423-842-7274. Another football inductee for the local hall will be Jim Hennen. Donnie Holbrook is going in for auto racing, Austin Clark and Malcolm Mackey for basketball, Warren Hill for boat racing, Chip O'Dell for boxing, Andy Morgan for fishing, Charlie Taylor for golf, Terry Cordell and Jim Jackson as officials and administrators, Marvin Burke and Janet Tate for softball, Scott "Quake" McMahen for sports media, Tom Younger for swimming, Audra Brannon Pumpelly for tennis, Danny Williams for track and field, Connie Young for volleyball, Mike Cross for weightlifting and Bill Burnside for wrestling. Owens played 16 years in the NFL and was a first-team All-Pro five times. He is third all-time in touchdown receptions and receiving yards and eighth in total receptions, and coming off a broken leg and torn ankle ligament he caught nine passes for 122 yards in the Eagles' Super Bowl loss to the Patriots in 2005. Hennen was a state heavyweight wrestling champion at Notre Dame High School and twice each in football and baseball was first-team all-city, and he participated in all three sports at Army as well. He also was all-state twice in football for the Irish and in 1961 added All-Southern and All-American recognition. Holbrook, a Fort Oglethorpe native who died in an airplane crash in 2012, won two world championships and set four world records in a 31-year drag-racing career that started in 1980, and his Holbrook Performance Parts business still has customers around the world. He was successful as a driver, crew chief, team owner, mentor and entrepreneur. Clark followed Roane County High School basketball stardom with SEC all-freshman honors and three years playing alongside Bernard King and Ernie Grunfield at Tennessee, and then he was a student assistant to Volunteers coach Ray Mears and served four years on the Middle Tennessee State staff before beginning a 36-year Baylor School coaching career that ended with a 522-411 record, 15 state-tournament appearances, four final fours and two state-runner-up finishes. He also was Baylor's athletic director for 102 state championships from 1990 to 2006. Mackey was an All-American at both Brainerd High, where he was MVP in a state tournament the Panthers won, and Georgia Tech before being a first-round draft pick of the Phoenix Suns. He played professionally in the NBA and Europe for 13 years and was the rebounding leader in France (twice) and Spain. He made a Final Four with Tech, where he was the leading career rebounder, the No. 2 shot blocker and a top-10 scorer and became an "ACC Legend." Hill was a very successful girls' high school basketball coach (260-61) before going into administration, and meanwhile he had an illustrious modified outboard career from 1969 to 1987 as a boat racer and an official. He won four A or B modified runabout national championships and overall was a national high point champ 41 times in various categories, and he won state-championship races in 13 states. He was the race chairman for eight national-title events and spent time as president of the Knoxville Hydroplane Association, vice president of the American Powerboat Association and commissioner of the APA's modified division. O'Dell won seven local Golden Gloves championships from 1973 to 1982 in weight classes ranging from 81 to 178 pounds, and he was an All-South champ in 1975 and a Tennessee representative in the Southeastern United States AAU tournament in 1978. Morgan, who lives in Dayton, was the national angler of the year three times in an FLW Tour bass career that spanned 23 years and included a series-record 73 top-10 tournament finishes and 21 championship appearances. He also has helped host archery deer-hunting television shows for years. He's moved this year to the Major League Fishing Bass Pro Tour. Taylor played No. 1 for the City High golf teams that finished first in the state in 1964 and second in 1965, and then he played No. 3 for the Tennessee Vols for four years, including one with an NCAA tournament appearance. He also won the Red Bud Invitational twice, but his greatest claim to fame may have been winning the City Amateur Tournament at age 18 over the legendary Lew Oehmig. Cordell, who died in 2011 at age 64, was an All-American bowler who served as secretary and president of the Chattanooga Bowling Association and made the Tennessee and Southeast bowling halls of fame. He also officiated high school football for 20 years, was a softball and baseball umpire and was the area TSSAA assigner for both diamond sports for a total of 22 years. He also was a respected girls' fastpitch softball coach. Jackson, a Hixson basketball captain in high school, was a TSSAA football official from 1975 to 1992 and a basketball official from 1979 to 1993 and officiated college basketball from 1985 to 2001 and NCAA football from 1986 to 2006 — working football games in 19 states and honored in 2002 as the Sun Belt official of the year. He retired in 2016 after 10 years as the football officiating coordinator for the Ohio Valley Conference. Burke was an outstanding men's fastpitch softball pitcher who became even better known as a teacher of girls' pitchers who expanded his expertise in kinesiology and mechanics into a business helping baseball as well as softball players. He taught for more than 30 years. Tate played basketball at Sequatchie County High School and UTC and is known to many for her years of success as a middle school and high school volleyball coach — and now as Chattanooga State's first coach in that sport — but she won state championships in softball at Hixson in 1983 and 1984. She was the TACA state softball coach of the year in 1984. McMahen, a former Hixson basketball and baseball player, was a UTC basketball walk-on in 1987-88 who has made his Mocs memories as their public-address announcer for 22 years. He also has a 30-year radio career with the "SportTalk" program — as the lead host since 2000 — and has been a high school football television analyst for 19 years. Younger was a swimming team captain his last three years at Baylor and graduated in 1974 with five individual and two relay school records. He earned All-America honorable mention in the 100 freestyle and 100 butterfly and then swam at Tennessee for a season and a half before having to quit for health reasons. He also was a YMCA national finalist in six events and swam in the masters program from 1981 to 1992, with four top-three finishes and a sixth in the 1986 Masters world meet in Tokyo. Pumpelly, another Hixson graduate, finished her junior tennis career ranked No. 1 in Tennessee and No. 7 in the South and then became Florida State's first women's tennis All-American and was the ACC player of the year in 1994. She won multiple City Closed and TVOC titles locally and played two years on the WTA pro tour with three satellite tournament doubles titles in Africa. Williams was a University of Georgia high jumper from 1970 to 1973 and was second twice and then first in the State Collegiate Meet. He was fifth in the SEC Outdoor Championships at 6-foot-8 in 1971 and fourth at 6-6 in the SEC indoor meet in 1972. Young started the volleyball program at Bradley Central and went 412-68 in her 18 years as coach, with nine trips to the state tournament, two titles and a runner-up finish. In 1991 she coached the winning team in the East/West All-Star match. She played volleyball at City High. Cross competed from 1968 to 2008 and again in 2018 in Olympic lifting, powerlifting and physique and has won 140 competitions with 29 state titles and eight national powerlifting championships. He also has four national silver medals. He won the 123-pound class world powerlifting title in 1974 and also has been a world runner-up. He set 35 world records, including a 549.5-pound deadlift in the 123 class and a 341-pound at 49 years old in the 114 class. Burnside was UTC's first wrestling All-American as a 1974 Division II national finalist, after coming from Miami with two Florida high school titles. He went 25-4 at 126 pounds in that 1973-74 season, and he and his wife became key members of the Chattanooga Takedown Club and helped run the Southern Open tournament for more than 30 years. They helped with the TSSAA state tourney for about 25.